What Size Instant Pot Should I Buy? Will it be right for my family? With so many different Instant Pot models out there a common question that I get is: What size Instant Pot should I buy? The Instant Pot 6 Quart DUO Plus is popular with our readers. There are a lot of factors that can go into your decision such as the size of your family, how often you plan to cook, and the types of meals that you make. But let's start with the basics, shall we? You can buy the Instant Pot in 4 different sizes. Not all of the model lines come in all of the sizes. Let me create a little chart to make it easier for you to see what I mean. This article explains the differences between the Instant Pot Models. This comment is purely based on my observations but it seems to me that the 6 Quart size is the one that is most common. First, there are more available choices in that size. Second, many of the Instant Pot recipes that I read (and publish) are made in a 6 quart Instant Pot. Is a 6 Quart Instant Pot Too Big For My Family? It is a common question and I understand the concern. But remember this - when cooking in an Instant Pot or any pressure cooker, for that matter, you only really fill it about 2/3 of the way full. You need to leave space for the pressure to build up and the boiling of the liquid or whatever else you might be making. So, 2/3 of 6 quarts is 4 quarts which is equivalent to one gallon. 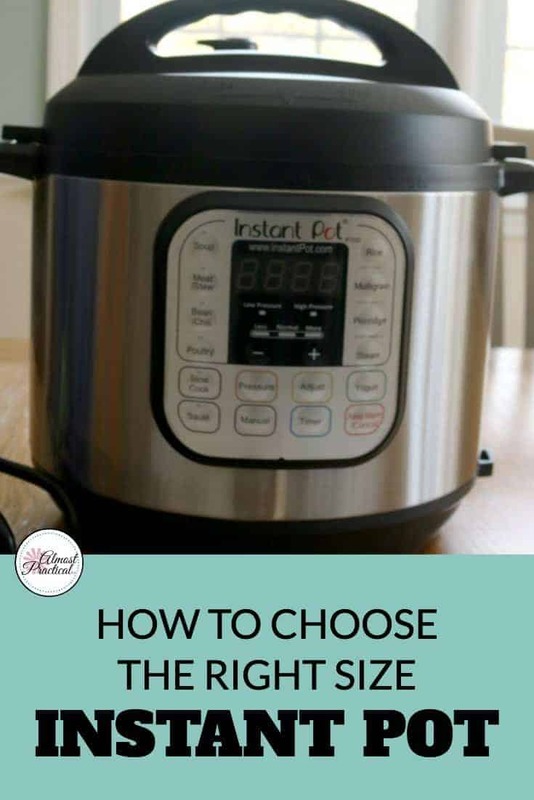 If you are worried that a 6 quart Instant Pot will be too big, then remember that you can always make less food in a larger size Instant Pot - you don't have to fill it up. What if the 6 quart Instant Pot is too small? What Will You Be Making In The Instant Pot? Now think about what you might be making for your meal. If I make soup for dinner, I usually serve it with a side of bread or some sandwiches. Chicken? Often I will serve it with a side of rice or mashed potatoes. Do you see where I am going with this? The main dish can either be the whole meal or just a part of your dinner. If you have a large family and you tend to make one pot meals, then maybe upping to the 8 quart Instant Pot is right for you. Or perhaps you like to make extra food for leftovers - again, a larger size could be better. Why Not Get 2 Instant Pots? If you have the space, you may consider getting 2 Instant Pots instead of one big one. This way you can either make two different dishes at once. Or, if you want to make a larger portion of one dish, you can split it up between both the Instant Pots. Personally, I have 3 units which is a little crazy, I know. I have two 6 quart Instant Pots and one 3 quart Instant Pot mini. Honestly, I love the 3 quart Mini much more than I expected to. smaller portions or side dishes. It's also really cute, but that is beside the point. My parents, who have a 2 person household, just bought the 3 quart version and are very happy with it. If you have a big household or if you tend to cook large quantities of food then you could consider an 8 quart Instant Pot. This will yield roughly 6 quarts of a finished recipe. The Instant Pot may be considered a small kitchen appliance, but make no mistake - it takes up a good amount of cabinet space. Even the 3 quart has some bulk to it. And the 8 quart? Well, you will need some height space there. If you get more than one unit - just make sure you are clear where you will keep it. The best way to figure out what size Instant Pot is right for your family is to see what works for other people. So, if you have an Instant Pot, please leave a comment below to help other people out. What quantities of food do you usually make? Do you feel that the size you chose is right for you? Where do you store the Instant Pot when you are not using it? Although everyone's situation is different making the right choice will depend on the above factors. You may also want to check out our Instant Pot Lover's Gift Guide here. « Your New Kitchen Countertop – Which Material is Best? Which size pot would you recommend for one person/ Sometimes maybe two. I would have to say that it depends on how much space you have in your kitchen and how much flexibility you want with quantities and recipes. If you have enough space for the 6 quart Instant Pot, personally, I think I would go for that. I say this because that leaves you enough flexibility to make both larger and smaller meals. For example, if you want to make a large batch of something and then freeze the leftovers for later. The 6 quart size is also nice because many Instant Pot accessories are made to fit in the larger pot. Steamer inserts, cake pans, egg holders, etc. Also, if you use a second pot inside the first one the 6 quart will be more roomy. Some recipes, even have you making a whole, one pot meal – putting the meat in the bottom and placing another pan on a trivet over top the food in the bottom to cook the side dishes. I have not tried this type of cooking – but have seen it done online and again it seems that a larger size Instant Pot would make sense. However, if you are just cooking simple recipes for one or two, the three quart size should accommodate much of what you make on a daily basis. So, in summary – I like the 6 quart for the flexibility that it offers, but the 3 quart takes up less physical space and should work for smaller portions. I hope that helps you with your decision.